As people become more aware of the importance of being sustainable at home, they are looking to their workplaces to follow suit. Sustainability focused committees are becoming more common, allowing management and employees to reduce the impact they have on the earth. Here are 10 simple ways you can green up your workplace. Technology is an integral part of every business. 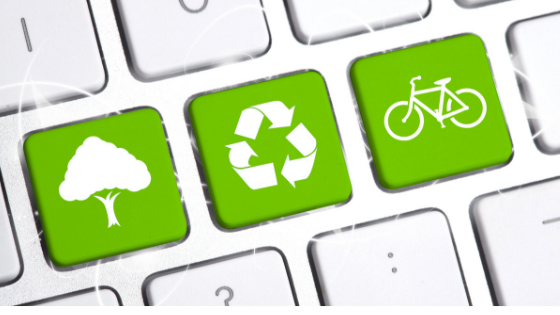 When it comes time to replace computers, laptops, printers, phones and more, take the time to drop off at your local e-waste collection depot. Once properly disassembled, many components can be reclaimed and put to use in other devices, saving our natural resources. Make sure you follow manufactures recommendations to wipe any data from your device. When you choose products with sustainable certifications can help you ensure that they are produced in ways that look after the people and/or environment they are produced in. Look for certifications like Fair Trade, Rainforest Alliance and Organic when choosing products like coffee, tea and sugar. Adding some greenery to your office has many benefits besides just making your work space look more inviting. Plants in an office help improve the air quality, help to reduce noise and have been shown to boost creativity and reduce stress. If you have the space, why not plant a flower or for the daring, a vegetable garden. You can pick the flowers to display around the office and use the veggies for the next pot luck lunch. Using a paper shredding service protects your business information from falling into the wrong hands. It also ensures that the paper in our not quite yet paperless society can be recycled into more paper. Choosing a water cooler that connects directly into the waterlines at your workplace means never having to lift that heavy jug of water just to get a glass of cool, refreshing water. A bonus is that there will be less demand for those plastic jugs and all the resources needed to make, clean and refill them. Making your workplace more sustainable doesn’t have to be a daunting task. Little changes add up over time, so don’t feel the need to implement everything all at once. Finding ways to encourage and reward employees for suggesting and implementing changes can make greening up your office fun for everyone. Little changes add up over time, so don’t feel the need to implement everything all at once.